Bake sweet potatoes until tender, peel and mash. Make sure all lumps are removed, straining if necessary. Lightly beat eggs. Blend together eggs and sweet potatoes. Stir in sugar, salt, cinnamon, ginger, and cloves. Blend in cream. Pour into pie shell. Bake in preheated oven at 400 degrees F (205 degrees C) 45-55 minutes or until knife inserted halfway between center and edge of pie comes out clean. Cool completely on rack. 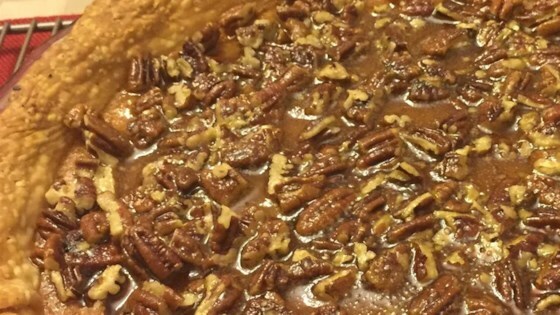 To make Caramelized Pecan Topping: Combine butter or margarine, brown sugar, and pecans. Gently drop by spoonfuls over cooled pie to cover top. Broil 5 inches below heat until mixture begins to bubble, about 3 minutes. Watch carefully, if cooked too long, top will turn syrupy. Cool on rack. The pie filling was really good, Too much sugar for the pecan topping! I would make this agian with less sugar for the topping! This is a great pie for begginers really easy to follow. I no longer fix "regular" sweet potatoes in the casserole with marshmellows on top...this is the only way my family will eat them now... The best one I have found yet! Great served warm, even keeps well and reheats for a couple of days. Our two year old loved it and that says a lot! This was UNBELIEVABLE! I added bourbon to the topping the first time, and the second time I made it added dark rum to the topping. This is definitely going to become a turkey day staple!